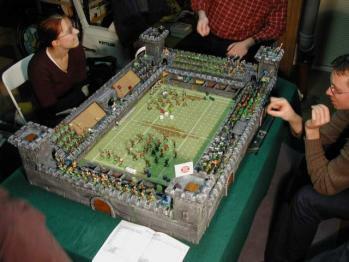 The humble Shogun Tora Kamikaze recently acquired a copy of the second edition of Blood Bowl. I found it to be an interesting, compact and challenging game. The rules encourage genuine tactical playing rather than just totting up point values and picking a killer combination from a bucket of 'special rules'. That, and the low outlay required to get a team together, makes me wish that twenty-five years ago I'd bought a copy instead getting sucked into the whole Warhammer thing and buying my own bodyweight in miniatures. I had an old notice board I was going to give away in a spring purge until we discovered it neatly accommodated the Blood Bowl 'astrogranite' pitch that came with the game, the various player sheets and the other gubbins, so I decided to turn it into a proper Blood Bowl pitch. Next, I covered sections of the board in PVA glue then sprinkled sand and flock over them. I have a large bag of a grassy kind of flock that, up to now, I struggled to find uses for. It was too bright and shaggy for my 15mm historical terrain but it looks just fine with 25mm miniatures. 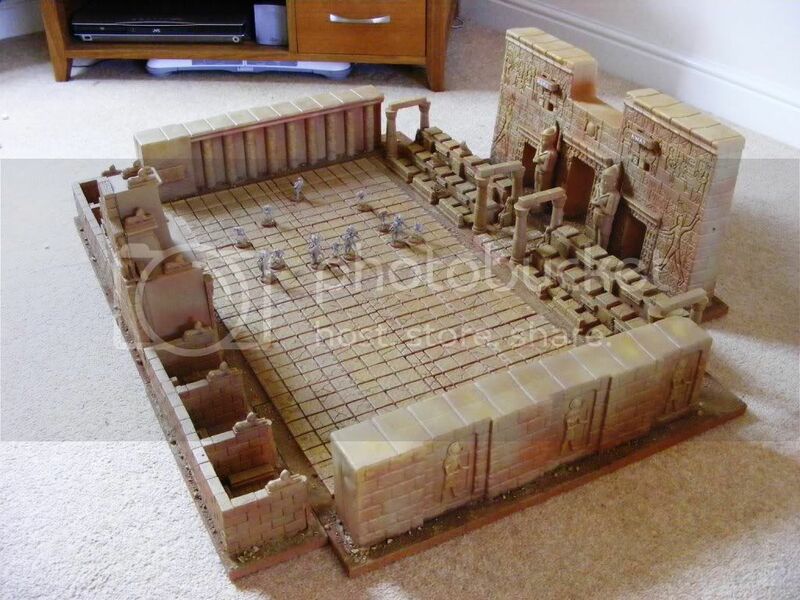 Below is the fully flocked pitch, with a third edition Skaven blitzer. I used a jar of coarse, stoney sand for bulk with a layer of fine sand over the top, to try and make it look like the regularly used areas of the pitch had been churned up more. It didn't work as well as I expected; I found some of the stones in the coarse sand were too big so my top-heavy test Skaven kept falling over in places. My solution was just to prise out the largest stones with a screwdriver. If you try making something similar and come across the same problem, be careful not to rip a hole in the cork board underneath when prising off anything you change your mind about. I was decorating the room at the same time and was rushing so I almost ruined the board at this stage! Only playing a game on it will confirm this, but I'm hoping that dividing the pitch into sections with these markings will be enough for us to tell exactly where a player is positioned. I'd like to avoid marking out every single square on the pitch if I can. 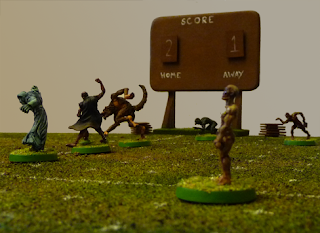 I know some people play a free-form version of Blood Bowl without a grid, but one of the things that I like about this game is its minimal use of rulers. 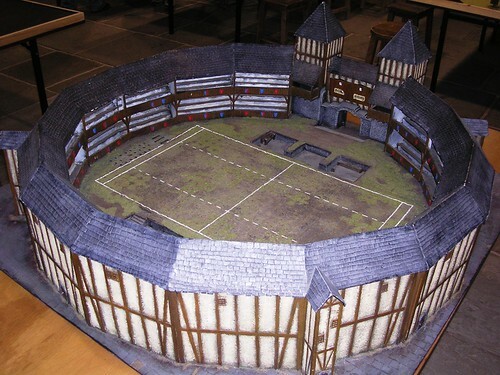 Eventually, I'll get round to adding a removable 3D scoreboard and a 3D turn counter at the ends of the pitch. I was also briefly tempted to one day add some proper dugout buildings, but I decided against because it would be counter to my main criterion of having a board that is easy to store when not in use. Besides which, no matter how much more work I put in on it, it would never measure up to some of the pitches out there!